Making Working in the Garage Easier Starts with Organization! While we often discuss what’s best for your Mazda and how to make it more fun, we rarely talk about where you spend all your time while working on your Mazda: the garage! Having a nice organized space to store and work on your ride will keep your Mazda’s exterior in better shape and help you get those CorkSport parts installed faster. After all, we all know someone who has a garage, but their Mazdaspeed lives outside because of how disorganized their garage is. Using the tips that follow should help you avoid being that friend. Tools are a vital part of any install, but they don’t do much good if they cannot be found and easily accessed. Below are some tips for keeping your tools neat and tidy. Have a good quality toolbox that is big enough for all of your tools. Toolboxes exist in all shapes and sizes, finding one that fits your tool collection and suits your preferences will help keep you organized. Organize your toolbox logically. Sort your tools by type but be sure you don’t have to dig to find the tool you need. I also like to put my most used tools in the drawers that are easiest to access. Upgrade your organizers. The basic metal or plastic socket organizers work fine, but for a few bucks more, you can get well labeled, magnetic organizers that will keep your sockets in place. The ones below have the bonus of being magnetic on the bottom for even more versatility. Similar organizers exist for wrenches, screwdrivers, and pliers. Pegboard is your friend. Using pegboard and assorted hooks for the large or otherwise awkward tools will help keep your toolbox easy to access. 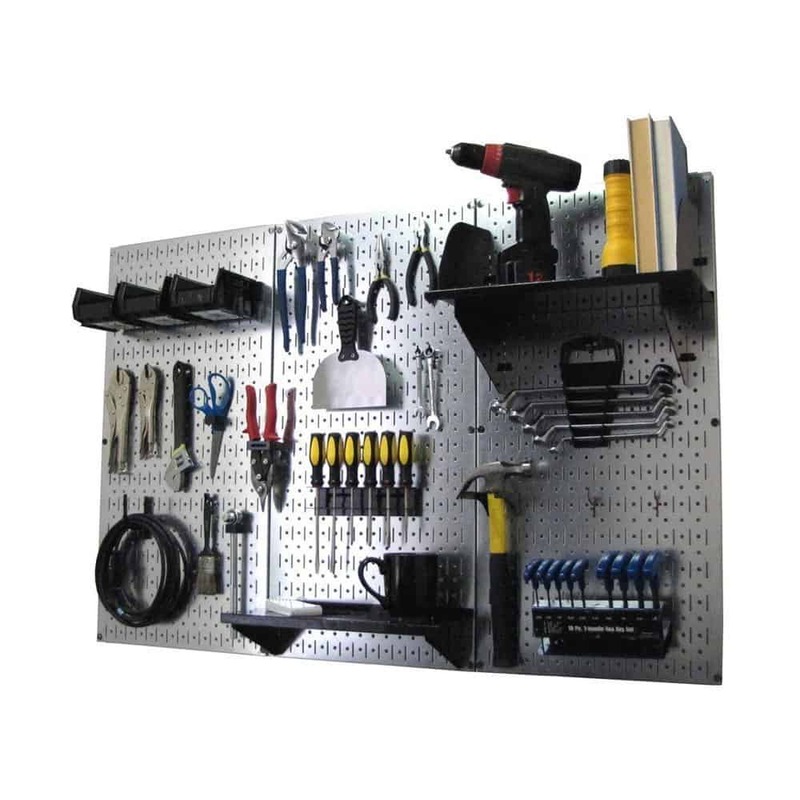 If you’re not into sifting through drawers, a large pegboard wall can even replace your toolbox! Having a place to store extra parts, jacks, and other miscellaneous garage stuff will ensure your garage stays a clean and comfortable work environment. Just having a place for everything can transform the feel and organization of your space. 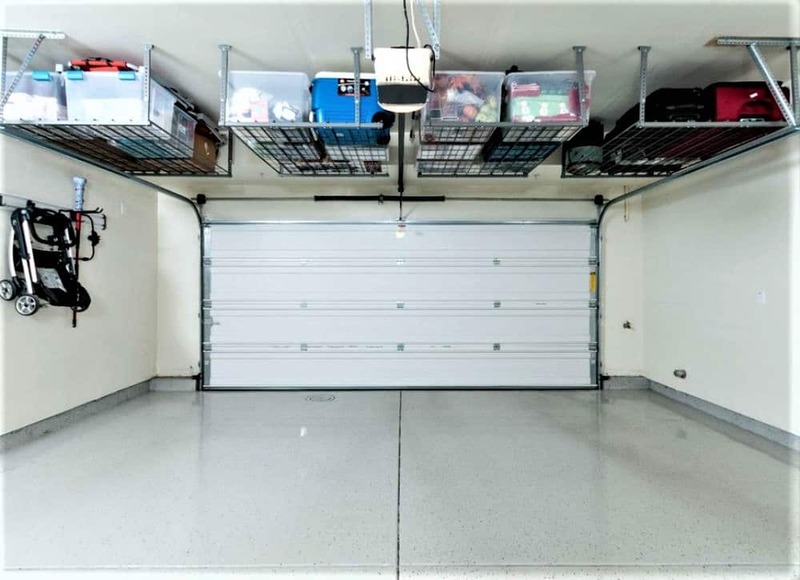 It may seem obvious but having a designated area for everything in your garage and ensuring it returns to its place removes a lot of the risk for a cluttered, unusable garage. Keep things off the floor as much as possible. Anything left on the floor will be awkward to work around and will make your garage feel messy. Simple shelving units and cabinets to get things out of the way can make a huge difference. Utilize your walls and ceiling as much as possible. Moving storage to the walls and ceiling allows you to maximize your usable floor space. Old kitchen cabinets can be repurposed to hang high up and out of the way until you need something. There’s a ton of ceiling storage solutions out there, be creative and finds what works best in your garage. If you’re lucky enough to have high ceilings, storage above the garage door works fantastic. Whether working on your Mazda, it can be easy to get distracted and messy, leaving you wondering where the extra bolts came from after you get everything put back together. It’s especially important to stay organized if your Mazdaspeed will be out of commission for a little while. Keep track of your hardware! We’ve said it before but merely using plastic bags and a sharpie to label where each bolt and nut came from makes it way easier when it’s time to put everything back together. 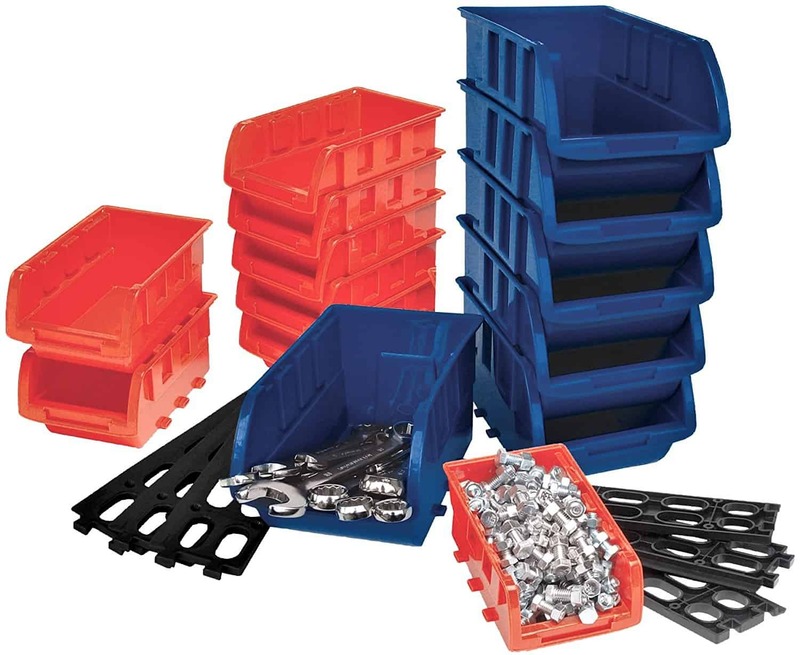 For a more short-term solution, we also use small plastic bins to keep parts and hardware together. If you have a pegboard, be sure to find some bins that will hang on the pegboard! Lastly, a fishing tackle box can be useful to neatly store extra hardware rather than having a random bolt drawer. Give yourself a good work surface. Whether you’re cleaning parts, swapping some studs over to a new turbo, or putting together the head on an engine build, having a nice surface to work on will make your life easier. To kill two birds with one stone, some larger tool boxes come with a great workbench top already installed. Short on space? Buy or make a workbench that can fold out of the way when not in use. Set up your parts in order of removal. This makes it easy to retrace your steps if you have to remove a bunch of different parts to get to whatever you’re working on. It’s extremely simple, but it’s saved me from having to retrace my steps because I forgot to install something. Keep your tools in a tool tray. We’ve all lost that 10mm socket while rolling around under a car. 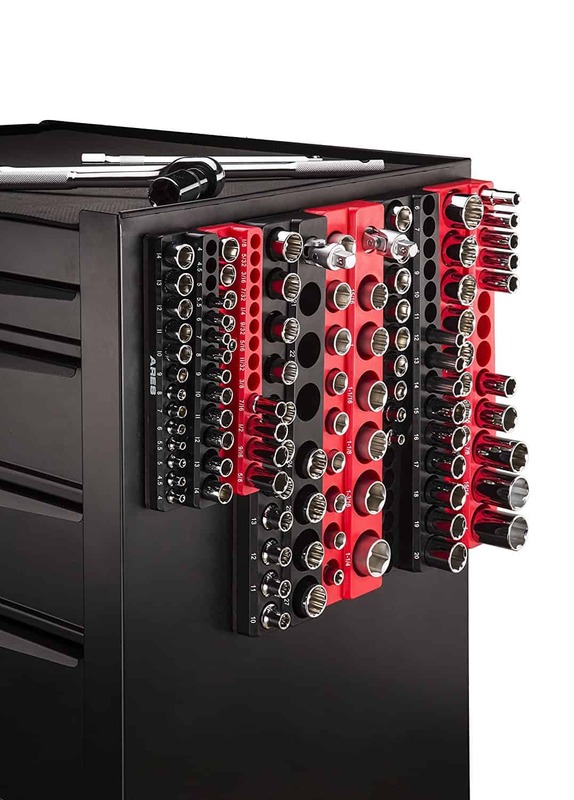 A simple tool tray will keep all your sockets and wrenches in one place and easily accessible. While not possible for every garage, these are ideal improvements that take your garage to the next level. Upgrade your lighting. Most home garages have a few dim light bulbs that work well enough but make it can be really hard to see when deep in an engine bay. LED shop lights can help you see what you’re working on, even after the sun goes down. Extra tip, strong zip ties can offer a temporary hanging solution if you’re unsure what locations will work best. Epoxy the floor. 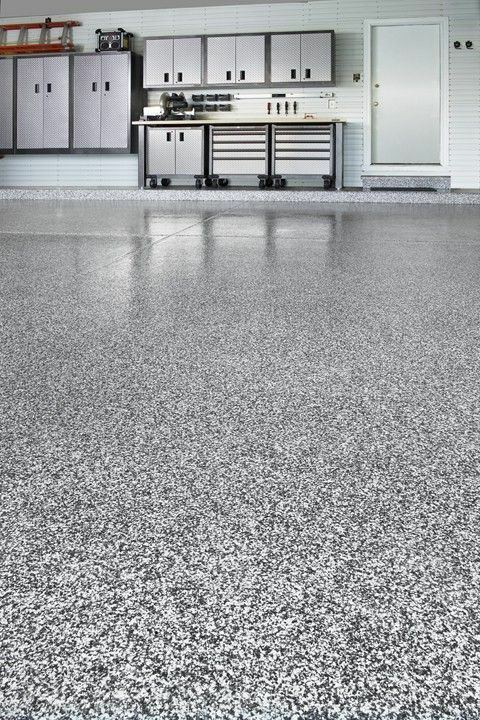 While it can be expensive to apply, nothing beats the look of a high-quality epoxy coated garage floor. It also makes spills easier to clean up, and you won’t have to worry about staining the concrete. You can even match it to your ride with the colors you choose! Install a garage fridge! Cold refreshments make any install that little bit easier. Plus, a garage fridge gives you a place to put all of your extra stickers! Please share any other tips and tricks you may have down below; we are always looking for ways to improve our experiences in the garage. We’d also love to see what spaces you guys and gals are working with! 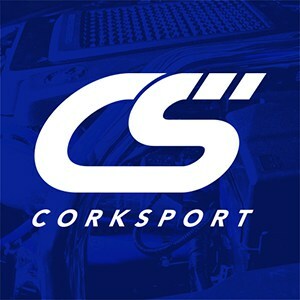 CorkSport walks you through our Top Tips and Tricks to keep your garage clean and organized. Giving you ample space to complete your project and rarely lose the tool you're looking for. Tips and tricks for Garage Organization will keep you working towards your Mazda dreams. I work in the aerospace sector so tool control is massive deal (and maybe a bit over kill for garage work) but we use shadow boards which are great for finding where your tools lives at the end of a job and also help build memory of where to find them the next time you need them! Also, use a tool tidy. Keep tools and fixings in it when doing a job because you always end up putting stuff down and forgetting where it went. It really does scrape time off of a job!